The import is a very useful tool if we want to load the peck of addresses without the necessity of their manual transcription. We click on the menu File, then we choose from him the option Groups. From the right we choose the group to which mom the intention to import the list, and from the left menu the option Edit group e-mails. Then from the left menu we click on the position the Import to group. The first field serves at choice the file by means of the button Selct file..., we click on the button and we choose the suitable file CSV. Then from the field Select group we choose the group to which mom the intention to import the file. The field Row separate we choose the separator of following columns in the file. We click Next step. 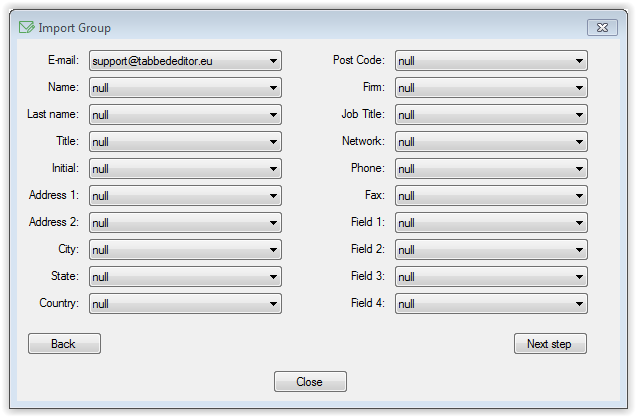 A next step is the adjustment of fields together with the data select received from the file CSV. We do this across the choice from developed fields of names of columns from the file. To pass on we click on Next step. Now is following the import of the file. Are shown among other things currently processings the line, the quantity of the line in the file and the quantity of found errors. After the end of the import we click on the button Close.